14 years old, and another ninja like Garu, Tobe is Garu's Arch-enemy and strives to defeat Garu at all costs with his two swords. Tobe is rarely capable of defeating Garu, however, much less Pucca. For some reason, Tobe is always trying to strike vengeance on Garu, though they never mention what Garu's ever done to him. The fact Tobe frequently mentions Garu's ancestors to Garu may be a clue to it. In the television series, he often makes quotes that range from overly melodramatic to just plain ridiculous (i.e., "The fly is walking right into my weblike... mousetrap."). It is shown that he and Garu might respect each other as friends after being stuck together, but Tobe quickly reverts back to evil. It is also shown that defeating Garu is Tobe's life goal. In Prince Not So Charming, when Tobe beats up Lazlo Gozalotovish (believing he is Garu), he claims that it is the most glorious day of his life, then after a long pause, he says, "Uh... What do we do now?" 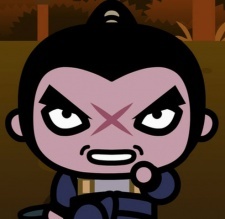 Tobe has an X-shaped scar between his eyes and usually wears his ninja mask. However, Tobe has been seen without his mask a number of times before, in which he has a samurai ponytail. He is accompanied by his ninja minions who, more often than not, eliminate themselves by misinterpreting Tobe's commands or just acting utterly stupid, much to Tobe's annoyance. They work cheap, as mentioned by Tobe when he and Garu are stuck together. Tobe's minions are almost never unmasked, even if they go to sleep. In "Ching it on" he is by first time a background character.